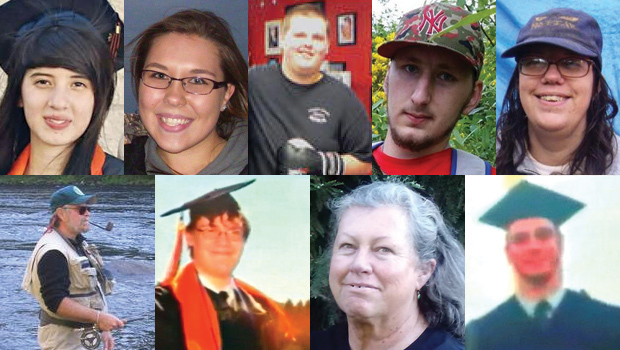 ROSEBURG, Oregon -- The names of the victims who were killed on Thursday when a gunman opened fire on a English class at Oregon's Umpqua Community College, killing nine and injuring nine others, have been identified by the Douglas County Sheriff's Office. Among the victims were the class professor, and several teenagers, including several recent high school graduates. According to the Douglas County Sheriff Office the victims are: Lucero Alcaraz of Roseburg, 19, Quinn Glen Cooper of Roseburg, 18, Kim Saltmarsh Dietz of Roseburg, 59, Lucas Eibel of Roseburg, 18, Jason Dale Johnson of Winston, 34, Lawrence Levine of Glide, 67, Sarena Dawn Moore of Myrtle Creek, 44, Treven Taylor Anspach of Sutherlin, 20, and Rebecka Ann Carnes of Myrtle Creek, 18. Victims families have begun releasing statements about their loved ones. The family of 18-year-old Lucas Eibel said their son loved volunteering at Wildlife Safari, and Saving Grace Animal Shelter. He was an amazing soccer player, and graduated Roseburg High School with high academic marks. He was studying chemistry, and was a scholarship recipient. "We have been trying to figure out how to tell everyone how amazing Lucas was, but that would take 18 years," the statement read. In a statement released by 34-year-old Jason Johnson's family, they said he was a proud Christian. He recently enrolled at the community college and his family was very proud of him for enrolling in school. "They felt that Jason had finally found his path," the statement read. The family of Quinn Cooper released a statement saying they are in shock, noting that Quinn was 18 years old, having graduated from high school in June. It was just his fourth day of college. "Quinn was funny, sweet, compassionate and such a wonderful loving person," the statement read. "He always stood up for people." The statement says Quinn and his brother Cody were inseparable. Quinn loved dancing, and voice acting. "I don't know how we are going to move forward with our lives without Quinn," the statement from the Cooper family read. "Our lives are shattered beyond repair." Lawrence Levine, 67, was the professor of the class, and among the victims as well. During Friday's press conference, the Chair of Umpqua Community College said classes will be cancelled for all of next week. But heroes have also emerged among the survivors, reports CBS News correspondent Mireya Villareal. According to his family, Chris Mintz didn't run away from the gunfire. The army veteran charged towards the gunman instead, trying to protect his classmates. "Tries to block the door to keep the gunman from coming in, gets shot three times, hits the floor, looks up at gunman and says, 'it's my son's birthday today,' gets shot two more times," said his aunt, Wanta Mintz. Mintz survived the shooting -- but spent most of the day in surgery. "His vital signs are okay. He's going to have to learn to walk again but he walked away with his life and that's more than so many other people did," said his cousin, Ariana Earnhardt. There has been a huge outpouring of support for Mintz, with $150,000 raised in just four hours on a GoFundMe Page. A relief fund has also been set up by State Rep. Dallas Heard for the victim's families, which will be distributed by the local United Way. Student Anastasia Bboylan also survived the shooting but is in critical condition, after a bullet passed near her spine. Her family told CBS News she has movement in her legs. All shooting victims were initially brought to Mercy Medical Center in Roseburg. Three female patients were then transported north to another hospital in Springfield. Students and community members of the small town gathered at a candlelight vigil for the victims Thursday night, and were still visibly shaken. "I heard a couple loud noises, our whole class heard them," said Angel Ardito. "I didn't hear any gunshots, I heard screaming," said Hannah Lee.